The Graduate School administers all research and most professional degrees, providing support (admissions, financial and operational) to the graduate fields, responding to graduate student grievances, communicating policies and procedures, serving as the registrar, and awarding graduate degrees. In addition, the Graduate School helps build the graduate and professional student community by providing programming, resources, and support. The Graduate School deans, in consultation with the General Committee of the Graduate School, establish policies for all graduate fields and administer resources in support of graduate education. The deans also help resolve student conflicts, administer the grievance procedures, approve nominations to the graduate faculty, assist with emergency loans for graduate students, guide faculty in the establishment of new graduate fields and programs, travel in support of student recruitment, and conduct activities in support of underrepresented minority graduate students. Our governing body is called the General Committee, and our “by laws” are described in the Code of Legislation. The General Committee is the administrative, legislative, and judicial board of the Graduate School and approves revisions to the Code of Legislation, approves appointments to the graduate faculty, and makes recommendations for new advanced degrees. 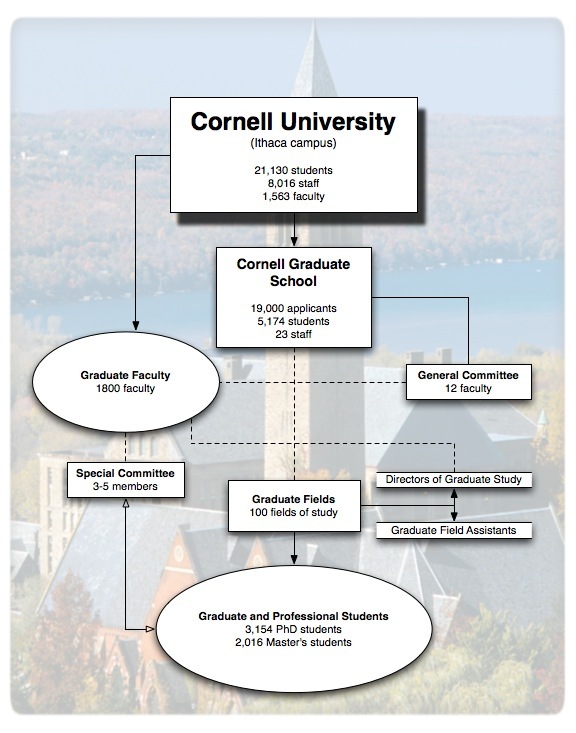 At Cornell, graduate study is organized using a field structure. Fields are composed of faculty members from one or more departments who come together around a shared intellectual interest, and may draw from different campuses or colleges. Graduate students are admitted to fields of study. The graduate faculty in each field nominate a Director of Graduate Studies (DGS) to the Dean of the Graduate School to oversee graduate education. Each DGS is assisted by a staff member known as a Graduate Field Assistant (GFA). Nominated for membership by each graduate field of study, the graduate faculty has jurisdiction over all graduate work and degrees and administers the programs for the general master’s and doctoral degrees by serving on special committees of graduate students. Professional degree programs are administered by members of the graduate faculty in the appropriate school or college, under agreement with the Graduate School. Find a graduate faculty member using the “Filter by Faculty” and the search box on our Fields of Study page. For research degrees, most fields of study have no core course requirements. Instead, students pick a group of faculty members to work with during their coursework and research. These faculty members comprise the “Special Committee” and will guide a student throughout their graduate study. The advisor, also known as the committee chair, works closely with students to make sure they meet their academic objectives. While the committee chair must be a member of the student’s special committee, committee members can be drawn from nearly 1800 graduate faculty. Cornell encourages graduate students to form a committee whose members cross disciplines.